Looking for a 100% obligation free quote? Leave your number below and we’ll contact you with a custom quote. What is new home landscaping? Residential and new home landscaping is the foundation from which we’ve built our business upon. We take great pride in designing and creating outdoor spaces and landscapes to enhance the beauty of our customers’ new properties. We take care of every detail with our focus on your complete satisfaction. A new home residential landscape design by the Wayne’s Landscaping team delivers the look you’ve always dreamed of for your new home. From excavation to new turfing or sleek retaining walls, if you can imagine it, we will create it. 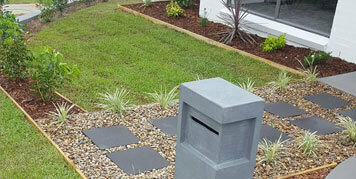 We are the landscaping Sydney design company you’ve been searching for. Of course, our landscaping design process begins with you, and a discussion with our certified in-house designer Wayne himself, a seasoned veteran with over thirty years of landscaping experience under his tool belt. From there, we can establish how to create the perfect outdoor space to complement your new home’s aesthetic. Using the latest in landscaping technology and expertise that comes with decades of experience within the industry, our licensed landscapers can offer you a range of options to enhance your new property to give it the charm it deserves. Our work isn’t complete until it meets your complete satisfaction. We aim to not only improve the quality of your new home but your life also. If you’re happy, we’re happy. With an endless supply of landscaping resources, our new home landscaping designs and execution will transform your outdoor space into something truly special. A properly designed and maintained landscape provides years of beauty for the occupants and adds immediate value to your new home. 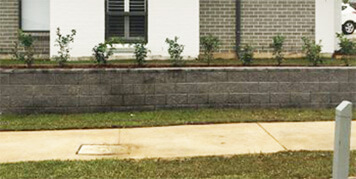 With Wayne’s new home landscaping design & services, you’ll always get 100% customer satisfaction. From the landscape installation to the ongoing maintenance, we’re passionate about your outdoor space. We provide you with different options for new home landscaping designs that suit your vision and lifestyle. We are not limited to a specific style. We match the design that will best suit your needs, wants, and budget. The new home landscaping designs process is the first stage of your landscaping and begins with the vision of your ideal yard. Our landscaping designers work closely with you to create a space that enhances your lifestyle while adding value to your home. Using three decades of outdoor landscaping expertise, Wayne’s Landscaping will turn your garden dreams into reality. Offering obligation-free quotes and consultations, we are extremely efficient and will provide a fast response time. Our goal is to make a difference in your life by creating your ideal outdoor space. to increase the value of your home? 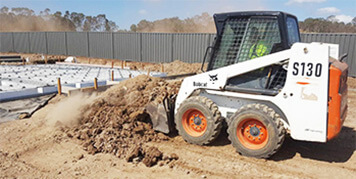 Wayne’s Landscaping and Excavation is a top-ranked landscaping Sydney design company. We are a locally owned and trusted business, fully licensed, qualified and can be found on Google with a variety of satisfied customer testimonials. Our gardens are done with an eye to save you money and thus provide inexpensive solutions. We use new materials in every garden we create, this includes concrete, timber, plants and structures. Our gardens are water conscious where they need to be, and are for people who don’t have the time or the money to spend on upkeep. But we also design your garden to be timeless, compelling, and a special place where memories are made. You know what you’re going to get when employing the team at Wayne’s Landscaping services. Have a Question or Looking for Free Advice? While it may be tempting to go with the cheaper quote, you could end up paying more in the long run. Unfortunately, there are too many unlicensed cowboys out there undercutting quotes to get the job, only to overpromise and underdeliver. These tradesmen don’t get repeat business but instead move on to their next unwitting client/victim. Wayne’s Landscapers are no such cowboys. For us, the customer is number one and delivering on our promise is crucial to maintaining the solid reputation we’ve cultivated for over thirty years in the business. Although DIY might seem fun and save you a few bucks, the truth is if you don’t know what you’re doing it will be incredibly time-consuming. Not to mention the risk of injury and lack of horticultural knowledge that could end up damaging your yard – requiring a costly repair. Sometimes it pays to let the pro’s do the work and a much better job, so you can relax and spend your downtime with the family or doing something else you love. Unknown with no positive history raises a red flag! It was a joy to work with Wayne and his crew. I am so stoked that I found you and took a chance on introducing you to my partner Shelly and recommending that she trust you to do all our landscape, patio, walkway and driveway remodelling. All of your employees were great to work with. We both especially liked Tim. They did a great job of making our home more beautiful and more accessible. 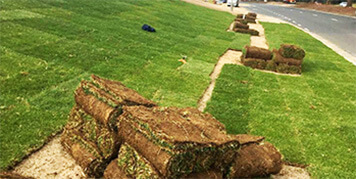 Looking for turfing in Sydney? Determine what services a landscape designer offers to see if they are the right fit for your project. It’s also important to gauge whether they are experienced enough for the scope of your project. Most landscape designers fall into three categories. Wayne’s landscaping & Excavation offer an obligation free consultation. From initial free consultation and site-evaluation through to design, build and signing off on the customer 100% satisfaction. Can I see examples of your past work? Most new home landscape designers will have a portfolio of work. If they don’t, consider it a red flag. Whether it be on their website, social media or in print, make sure you see evidence of past work. Legitimate client testimonials are also a good sign. Also, check out their credentials, evidence of the training, license, etc. Degrees from accredited landscape design TAFE and memberships in professional organisations such as the NSW Department of Fair Trading are also a positive sign. As a general rule of thumb, the less information readily available about your new home landscape designer, the more cautious you should be. Do you offer garden consultations? Some landscape designers will typically come over to your property, take in the garden, listen to you and your garden goals and perhaps bounce some ideas around for the design. This is the time for you to get a feel for the designer and whether you are on the same page and thus be a good match for the project. Don’t expect all initial consults to be free of charge. The reality is it’s two hours of a professional’s time. However, a common practice is for designers to subtract the consult fee from the cost of the design if you end up going with them. What ideas do you have for our garden? Even if you have a clear vision for what you want, don’t forget to ask what vision the designer has for your landscape. Not only will you get a different and professional point of view but asking this will also help determine if they are the right man or woman for the job. And don’t be afraid to speak up about what you like and dislike in their ideas or if anything’s missing from your wish list. Now is the time to determine whether you are both on the same page. Get to know the new home landscaping process from the get-go so that you’ll know what to expect once the project commences. If the response is vague then ask for more details. Basically, make sure the landscaper has a process! How much does a new home landscaping cost? Crystal clear communication regarding the estimated new home landscaping cost of the project and your budget is crucial. Ask for a range of cost for both the design and installation. If a certain look you’re after doesn’t fit your budget it’s your responsibility as a client to be honest about it to your new home landscape designer. After all, they may have creative solutions to stretch resources and save money to get the look you’re after. The time it takes to design and install a landscape depends on the size and scope of the project. Always allow for unexpected setbacks during installation such as weather. Instead of asking a landscape designer to have the installation completed by a certain date, ask for an estimated range for which the project can be completed. Don’t be fooled by landscaping reality TV. Although it can inspirational and entertaining, the irony is it’s not reality at all. A real site work rarely has a team of 24 people working around the clock. High-quality new home landscaping is both art and science and takes time to install. Do you include warranties in your work? It’s important to know whether your landscape designer has any guarantees or warranties for the work. Most licensed professionals will provide you with warranties. This is a good sign and will offer you the priceless peace of mind. How much maintenance will it take to keep the garden looking good? This depends on the styles of gardens and plants used as they require very different levels of care. Be upfront with your landscaper about how much maintenance you are willing to commit to or whether you have hired a gardener going forward. You’ll want to keep your landscape alive and flourishing for years to come so ask your landscape designer they can recommended maintenance gardeners or if they can take care of the garden going forward. Part of our landscaping mission is to improve the lives of client by transforming their outdoor space into their happy place. As such, no job is completed until the customer is 100% satisfied. This is our Wayne’s Landscaping Guarantee. We specialise in landscaping design, installation and maintenance for residential and commercial clients. Speak to us to see how we can help. Would not hesitate in recommending Wayne and his crew. He undertook a difficult job for me in a timely and efficient manner, cleaned up the site after and did everything he said he would when quoting. Thank you Wayne's Landscaping. Wayne and his crew are very professional and easy to work with. Highly recommended. We are very happy with the landscaping Wayne did. It has made a huge difference to the look of our front yard after the council wrecked it by putting a footpath in which was significantly lower than the level of our yard. Wayne was pleasant to deal with, did a great job and had the best price. Wayne was great. Got phone call the same day I posted the job. Attended the next day to quote. Once I approved the job they were out the next business day. Arrived on time and were done by lunch time. Everything was cleaned up and back the way they found it. Good honest guys that I would gladly recommend or use again. We'd like to thank you, Wayne and the team, for all your hard work on our landscaping! It looks and feels like a home now. Wayne really went above and beyond for us and we couldn't be happier with the final result. We appreciate the effort and if there's anything we can do to help promote you guys, please let us know!